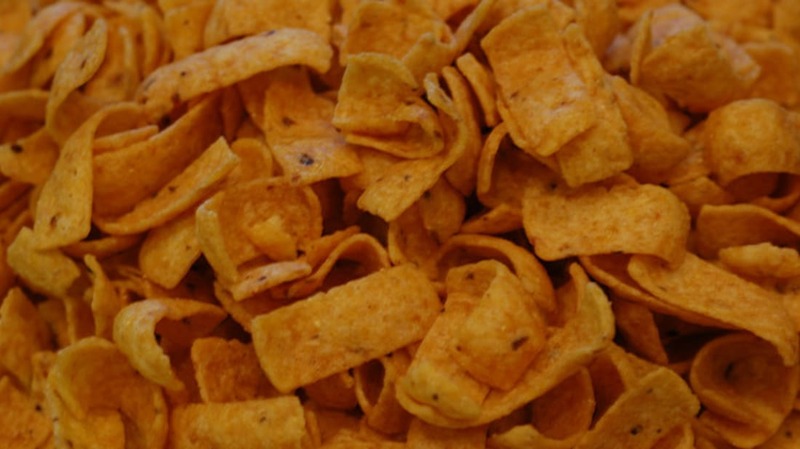 Salty, crunchy, and the perfect companion for everything from chili to sandwiches, Fritos are a stalwart of the chip aisle. But how much do you really know about their story and their spicy international travels? 1. THEY WERE A BARGAIN IN THE CLASSIFIED ADS. When Charles Elmer Doolin needed a new snack to pair with ice cream to lure customers to his San Antonio shop in 1932, he found a billion-dollar opportunity in the classified section of his newspaper. As the San Antonio Express-News reported earlier this year, Doolin’s eye landed on a listing that read “CORN chips business for sale, a new food product, making good money.” He was intrigued enough to contact the owner of the chip business to arrange a tasting. 2. THEIR INVENTOR WANTED OUT OF THE CORN CHIP GAME. When Doolin responded to the ad, he met Gustavo Olguin, a Mexican cook who had perfected a recipe for curly chips made by frying corn masa, the dough used for making tortillas. Olguin needed cash to fund a move back to Oaxaca, and Doolin was impressed with the chips. He paid Olguin $100 for a list of 19 clients who had been buying the fried chips, the modified potato ricer Olguin used to make the chips, and the recipe. 3. THE NAME IS ACCURATE. You can’t get any more straightforward than the name Doolin trademarked for his fried corn chips. “Frito” is Spanish for “fried.” Smithsonian has delved into the etymology of this name, which was possibly an American corruption of the Spanish “fritas,” or “little fried things.” The switch from “a” to “o” may have been an effort to make the name easier to trademark in the United States. 4. DOOLIN'S MOM PLAYED A BIG ROLE IN POPULARIZING THE CHIPS. 5. FRITOS BECAME HUGE AFTER JOINING UP WITH ANOTHER SNACK GIANT. Fans of salty snacks got a huge boost in 1945 when Doolin’s Frito Company began working with Herman W. Lay’s potato chip business. In what would prove to be an mutually beneficial arrangement, Doolin acquired the rights to distribute Lay’s potato chips in the Southwest with Lay receiving the rights to sell Fritos throughout the Southeast. The deal worked out for everyone, and in 1961 the two companies merged to form snack giant Frito-Lay. By 1979, the combined company was pulling in over $1 billion per year. 6. DOOLIN WANTED THE PERFECT CORN FOR HIS CHIPS. While Doolin may not have invented the chips that became Fritos, his ingenuity and marketing acumen helped him mass-produce the snacks and develop a hungry public. That wasn’t the end of his inventiveness, though. As Doolin’s daughter Kaleta writes in her company history Fritos Pie: Stories, Recipes, and More, Doolin worked with Texas farmers to develop his own special hybrid corn variety that gave the perfect flavor when turned into Fritos. 7. DOOLIN WASN'T AN AVID EATER OF FRITOS. 8. THE FRITO PIE'S ORIGINS ARE MYSTERIOUS AND CONTENTIOUS. Cooks who experiment with Fritos have had plenty of success, but the most enduring Frito concoction is the Frito pie, a tasty pile of Fritos topped with chili, cheese, onions, and other ingredients. Who created the Frito pie, though? That’s a culinary question with many answers. Frito-Lay gives Daisy Doolin credit for the dish, but residents of Santa Fe, N.M. insist that the snack originated in a local Woolworth’s. It’s a mystery that shows no signs of clearing up. 9. TEXAS DEFINITELY MADE THE FRITO PIE HUGE. Texans may or may not have invented the Frito pie, but they’ve definitely elevated it to some strange new places. In 2013, the State Fair of Texas recognized Fritos’ 80th birthday by creating a 1325-pound Frito pie to set a Guinness record. Texas Monthly noted that the concoction required 660 cans of Hormel chili and 635 bags of Fritos. This behemoth wasn’t the fair’s first twist on the Frito pie—in 2010 a deep-friend Frito pie earned recognition as one of the fair’s top culinary offerings. 10. FRITOS HAD THEIR OWN RESTAURANT IN DISNEYLAND. Soon after Disneyland opened in 1955, the Casa de Fritos opened its doors to give visitors a taste of Mexican favorites like tamales and enchiladas. The restaurant stuck around through the 1960s and into the 1970s, and in some tellings, it was indirectly responsible for the birth of another Frito-Lay favorite, Doritos. The restaurant featured an animatronic version of longtime brand mascot Frito Kid, a cowboy who would be retired in the late 1960s for the blessedly short-lived (and more than a little offensive) Frito Bandito. 11. INTERNATIONAL SNACKERS GET SOME WILD FLAVORS. Regular Fritos are a hit with Americans, but around the world, there are some more unusual varieties. Want chutney-flavored Fritos? South Africa has you covered, and they’ll kick in a tomato variety for good measure. Mexican fans can munch chorizo-and-chipotle Fritos.